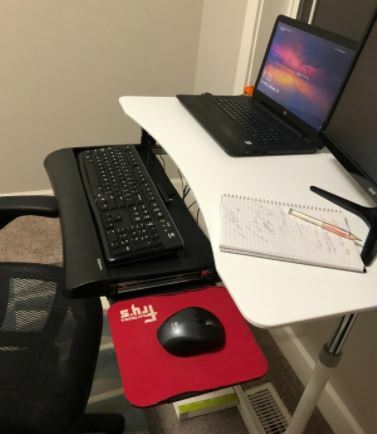 If you’re using a desk that doesn’t have a built-in keyboard space, then you’re being robbed of valuable storage space, and potentially putting your wrists at danger. Human beings aren’t built to sit at a desk for hours each day. But we do, which is why one of the most common type of surgery in the United States is for carpal tunnel syndrome. Ergonomics is the battle against the kind of fatigue and injury a person can suffer dwelling at a desk. Typing on a keyboard engages the posture of nearly your entire body, but especially your shoulders, arms, and wrist. Using a keyboard with an improper incline can lead to strain, and potentially contribute to repetitive strain injuries like carpal tunnel. 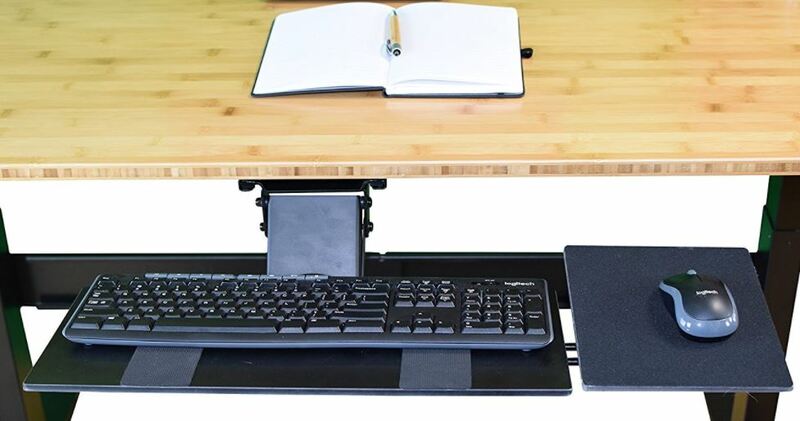 By contrast, having the right keyboard tray equips you to switch between sitting or standing postures, ensuring your workstation can accommodate essentially any posture or position you throw at it. Injuries aside, under desk trays can be an excellent opportunity for extra storage space. If you’re working inside a compact area, then a keyboard tray is like being able to add another shelf to the room. Keyboard trays can be drilled, clamped, or otherwise attached to your desk in a variety of different ways. That means even desks which you think may not support an under desk tray may actually be suitable with the right pick. Keyboard trays are made up of a few simple parts. 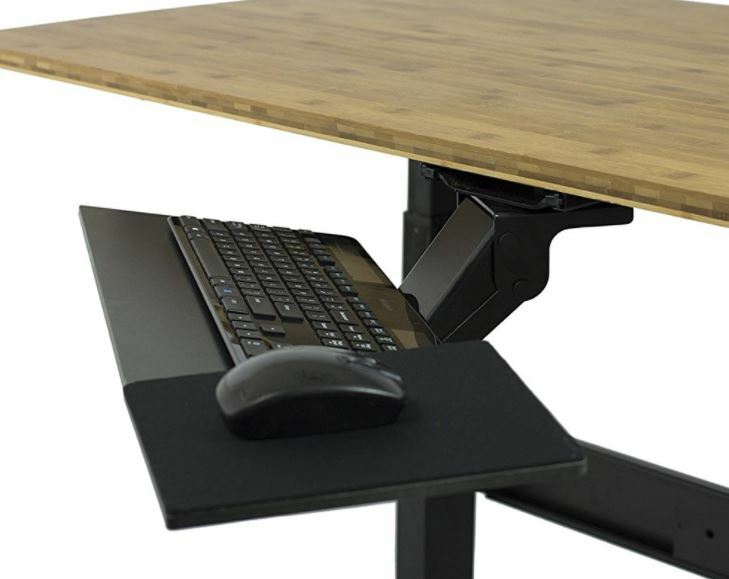 More often than not, you’re looking at a platform for the keyboard, and a track bracket that’s mounted to your desk. In most cases, you’ll need to drill or screw the track to your desk, and then attach the platform to the mounted bracket. That may sound simple, but the devil is in the details. How you’ll make the attachment to your desk, the adjustability of the tray, and many various aspects of design can come into play when making your selection. You’ll want to think about the dimensions of the tray you’re choosing. If you end up with a track that’s too long for your desk, it will awkwardly stick out from your desk after it’s installed. On the other hand, you don’t want a track that can’t be pushed back far enough to fail to conceal your keyboard. The tray you select should match not only your desk, but also the amount of space you need for your computer peripherals. Another factor is if you’re only going to end up sitting in front of your keyboard, or if you’ll be standing. That’s because in the interests of ergonomics, your goal is to minimize unneeded movement. You want everything to be well within your reach while resting comfortably. Sitting or standing can affect the kind of angular tilt you want for your keyboard, and consequently the tilt you want from your keyboard tray. You might have an under-bar on the desk that prevents you from drilling on a keyboard tray, but you can find alternatives to get around those types of designs. If at all possible, you will want to end up choosing a drilled keyboard tray. Drilling helps ensure the tray can hold firmly while it’s being used. Most alternatives, like clamps, can provide a fairly sturdy and non-intrusive connection. But they’re almost always likely to feel wobbly when you’re typing on them, making those connections better suited to being used as storage than anything else. For the most part, you don’t have to think about the sliding distance of the track. But you do want to think about height adjustments. Some tracks will help you better adjust their tilt and height to accommodate a wider range of sitting positions and postures. You may also find trays that swing side-to-side in addition to sliding forward and backwards, depending on the range of adjustability you’re seeking. In the interests of ergonomics, most keyboard trays include a wrist rest. They’re usually constructed of a soft foam gel, and are great for providing extra support. But the quality of their material varies widely. Apart from the quality of the material, the keyboard platform should reflect your aesthetic preferences and space requirements. 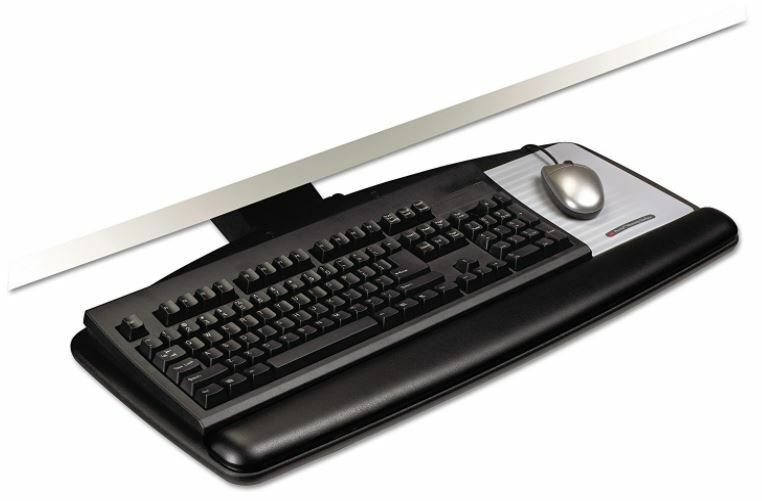 Larger platforms may be able to hold a full sized keyboard and a mouse on one single level. Others are built with a compact spot intended for a keyboard, with an attachable slide-out tray for the mouse. Clearance is another concern. You’ll want to make sure there’s enough space left for your legs once the tray has been installed. Some keyboard trays use low-profile designs in the interest of ensuring knee clearance. Be sure to measure under your desk to get a rough idea of how much space is between you and the desk when you’re seated. Before you make your choice, take the time to measure the dimensions of your current mousepad and keyboard. That can help you get a better idea of how well your peripherals will fit on the tray. 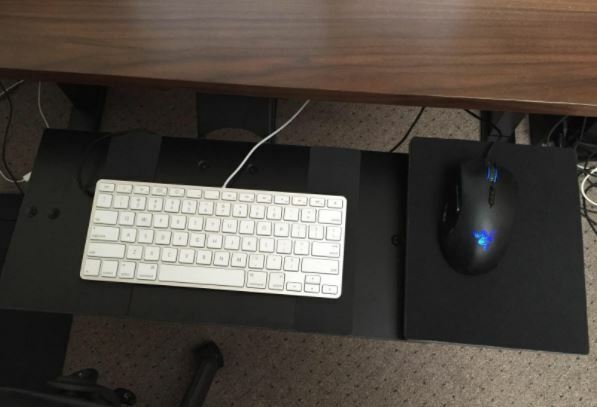 If the tray has an independent mouse platform, you’ll want to ensure the dimensions are appropriate for your mouse pad. You may also want to look for a separate mouse tray, made to clip to the rail and slide in and out like your keyboard. From a glance, you can tell that 3M’s 17” track is designed for more modestly sized workstations. Nevertheless, the tray itself is sufficiently broad to hold both a mouse and keyboard. Additionally, you’ll find this tray can support an almost full range of adjustability. The result is a combination of comfort and adjustability that’s unbeatable for its price point. 3M’s tray makes use of a wooden construction that’s ideal for eliminating the kind of bouncing feedback you get when typing on a flimsier tray. And that wood construction is paired with a leatherette gel wrist rest to match quality and comfort. In the interests of ergonomics, you’ll find height adjustment for 1” above your desk and 4.5” below it. The tray itself uses a spacious 25 x 16.4 x 2.4-inch design, making it deep but compact. In other words, it’s ideally sized to fit any large keyboard, as well as your mouse. For adjustability, this tray offers a fairly powerful range of motion. You can adjust the tilt of the tray both forwards and backwards by 15 degrees, allowing you to find a neutral positon for your wrists. It’s worth noticing that the entire tray tilts as one unit, and there’s no separate platform for your mouse. Whether or not that’s convenient or not depends entirely on your purposes. On the backside of the tray you’ll find several integrated round spaces that can be used for cable management. That can help keep your office space organized and prevent cords from being entangled in the keyboard track. The track itself enjoys a smooth glide both forwards and backwards, thanks to the steel ball bearings in the construction of the track. 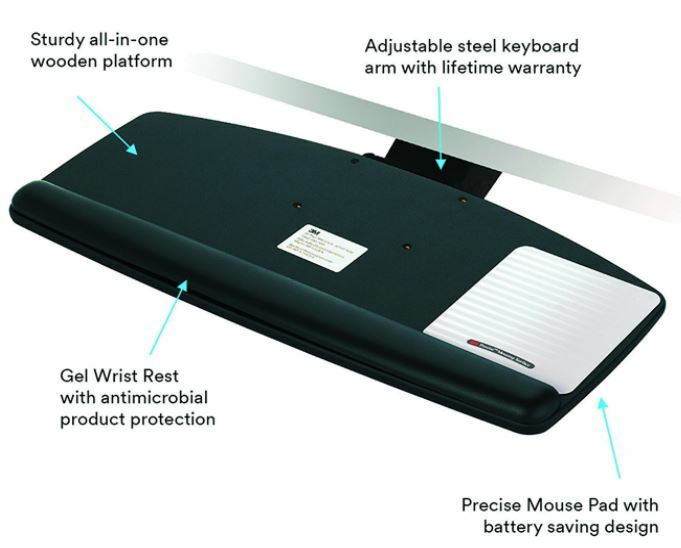 3M also includes a mouse pad, lifetime warranty for the arm, five-year warranty for the platform, and one-year warranty for the wrist pads. If your desk has a crossbar running underneath which prevents the installation of typical rail-based keyboard trays, then the Office Suites Underdesk is the alternative you’re looking for. The rails on their tray are easily installed on nearly any desk with a crossbar design. Some keyboard trays are made of finely constructed machine parts that are built to last forever. But if you’re not using a desk that looks like it belongs in the White House, you may not need something so extravagant. The last thing you want is for your keyboard tray to cost more than its adjoining desk. For an inexpensive alternative, Fellowes Office Suites’ tray offers a simple solution for a simple problem. The tray itself is made from a durable polymer that’s impact resistant, and composed entirely of recycled materials. Impact resistance is an important quality for a smaller tray like this because it ensures that the mechanical tracking won’t break if something falls on the tray. As far as the track goes, it’s constructed with a ball-bearing design that offers a smooth and consistent motion as you pull the tray forward and backward. On the back of the tray, you’ll find a conveniently placed keyboard stopper that will hold your keyboard firmly in place as you work. The only significant criticism that can be made of this device is the hard plastic tray doesn’t provide much in the way of comfort or padding, and the tray may not provide an ergonomic position that’s optimal for standing. Fellowes Office Suites’ tray use a fairly compact 11.6 x 22 x 2.3-inch design. The tray is moderately height adjustable, with 3 different height presets you can select between. Those presets allow you to have 2.125”, 2.5”, or 2.77” of space beneath the track. The tray also includes an instructional template for installation, but installation is simple enough that you probably won’t need it. Sometimes you want more than a basic keyboard tray that slides forward and backwards. 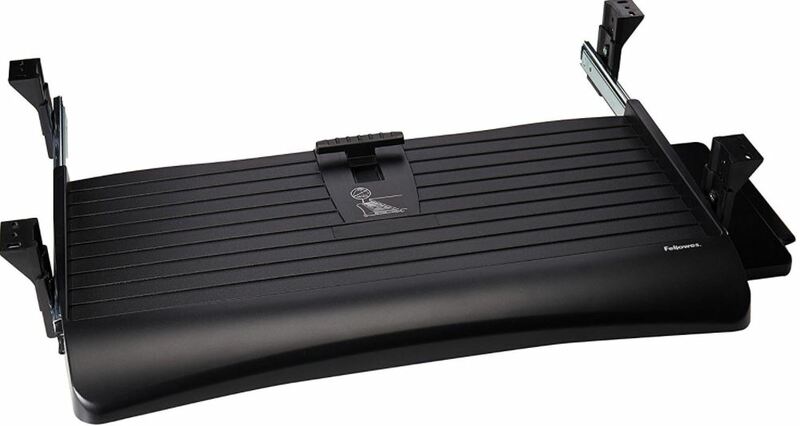 For a fully articulating keyboard tray, you’ll want the Uncaged Ergonomics KT1-b. The KT1-b makes use of a particularly low-profile design that allows you to make a wide variety of height adjustments. And the fully articulated motion of the tray allows it to swing side to side. No matter where you’re sitting or standing, you’ll be able to raise, tilt, slid, swivel, or otherwise find the perfect position for your tray. The surface of Uncaged Ergonomics KT1-b is made of a non-skid material that’s specifically designed to hold your devices in place. Comfort isn’t overlooked, with the tray including an exceptionally comfortable foam mousepad. 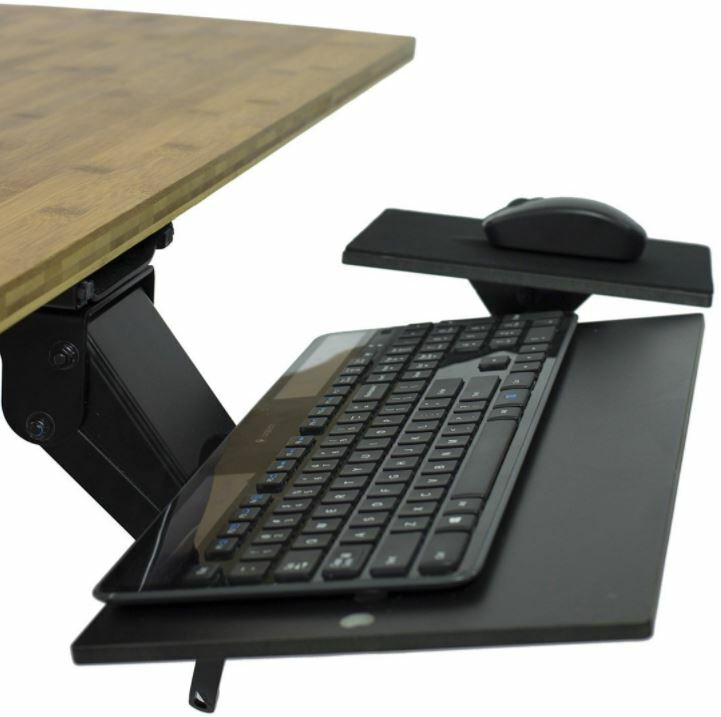 And the fully articulating motion of the mechanical arm allows your tray to move a full 360-degrees, making this tray ideal for both standing desks and active chairs. This device makes use of a fully adjustable mechanical arm, composed of high strength steel. The 18.5 x 8.75 x 8.7-inch design is ready for any full-bodied desk. And the tray height is fully adjustable, with a locking lever to elevate the keyboard within a 4.5” range. 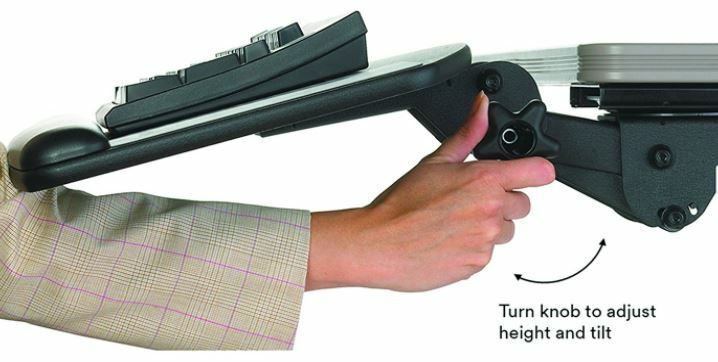 This allows you to quickly adjust your typing angle with neutral or negative tilt. And when you’re done with the tray, the 16” rail length ensures the entire tray slides neatly under your desk. The KT1-b is built with an independently adjustable mouse tray, and you can also adjust the distance between the keyboard tray and the mouse tray for a fully customized fit. If you so pleased, you could have your mouse sloped downwards towards you, and your keyboard sloped upwards towards you simultaneously, which provides a powerful and full range of ergonomic possibilities. If you’re looking for something simple and inexpensive, Fellowes Office Suites has a fairly sturdy tray relative to its price. It’s a great choice for anyone attaching a tray to an under-bar desk. 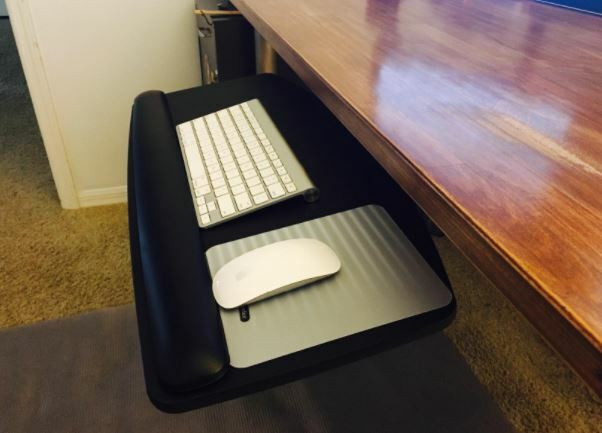 Although this keyboard tray doesn’t go out of its way to make you comfortable, if you’re looking for a simple tray, it will get the job done. If you value comfort in addition to functionality, then you’ll want to consider 3M’s keyboard tray. It has a considerable range of articulation, and a wide range of height and tilt adjustability. You’ll have no problem finding the right angles for comfort, and you’ll appreciate the sturdy wooden construction of the tray when you’re typing on it. But a sliding tray will never have as much free motion as a fully articulated mechanical arm. Uncaged Ergonomics has it your choice if you want a complete range of adjustability. Their full 360-degree swivel tray and independently adjustable platforms are unmatched. No matter the angle you’re sitting at your desk, the chair you’re using, or whether you’re sitting at all, Uncaged Ergonomics’ tray can provide a comfortable fit.